I don't know why but I just f*cking love this card and everything about it. I'm still pretty early in my collection building, and as a non-pack-buying player I have to be smart about what legendarys I craft. Which is a shame as aside from Cenarius, this is a card I would love to have for my control hunter. This actually a really interesting card... Too bad it's a Hunter class card. I bet it could see a lot of play in control decks such as Warrior, or even in Mage decks since they can trigger it with their Hero power. Sadly it's not used much by Hunters either, sad to see such a great card wasted. I was thinking of a Tundra Rhino + Elven Archer + Arcane Shot with Thaurissan deck with this card, but I don't have the required cards. Imagine this in a grim partron deck. Good thing Warsong is over with. Got a golden one after a 3-3- run in the arena. A card is declared OP (at least for me) if it is overused and smashes all the competition. Gahz'rilla doesn't do both of those. Undertaker was overused and smashed all competition, hence it was nerfed. The doubling of an attack is really huge buff. Once I played against paladin and he changed attack to 1, but it stayed on the battlefield and gained up to 8 attack in the end of the game. Really solid card, a little strong for the cost, but all classes have very strong legendaries, so I think that this card is OK. I loved scrolling through these comments, predicting the apocalypse to come when GvG is released and Gahz'rilla's terror unfolds. 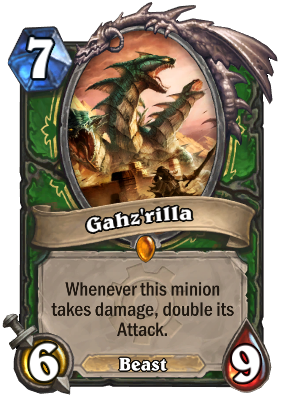 It's kinda sad actually, that nobody uses this card, like ever, and Hunter stayed the way it was before this card - all face. The reason this card isn't the best card ever is because of cards like Power Word: Death, Mind Control, and besides, by turn 7, people can usually do about 9 damage in a turn. someone explain to me how this is not the most overpowered card in the game. by like 5000* over second place?